Created in collaboration with the makers of LA Scoring Strings, NI’s new Symphony Series instrument puts a 60-piece string ensemble at your disposal. 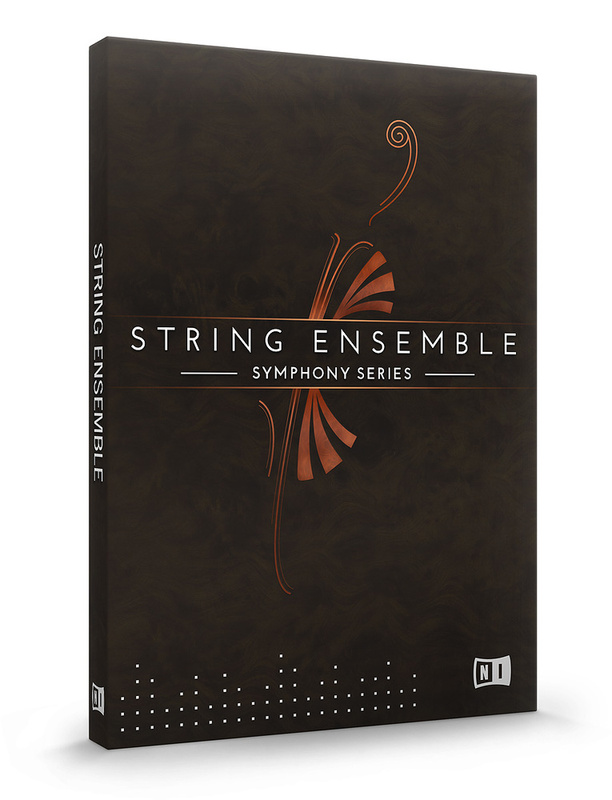 The second instalment of Native Instruments’ Symphonic Series of orchestral instruments, String Ensemble, follows hot on the heels of the impressive Brass Collection. While the standard practice is to use the same creative team, orchestra and recording venue across such a series, this is not the case with these two libraries. Brass Collection was recorded at St Paul’s church in San Francisco by sample maestros Soundiron, whereas String Ensemble (henceforth referred to as SE) comes from the hallowed halls of Audiobro. Why hallowed? Because Audiobro are the very same company responsible for LA Scoring Strings (LASS), considered by many to be one of the finest sampled string libraries in the business. So, is SE a redux of LASS for the masses? Well, no — SE is crafted from new recordings done in Budapest, whereas LASS was recorded on an LA scoring stage. Does it matter that the strings and brass are playing in venues 6100 miles apart? Considering that a good many people mix and match orchestral libraries from disparate sources, then probably not — as long as it sounds good. And given SE’s provenance, expectations will be unsurprisingly high. Maintaining consistency across the series, SE employs the same stately black and gold GUI as the Brass libraries, and barring some conceptual differences, the same operational paradigms. Content is arranged quite simply into five presets: one each for violins, violas, cellos and basses, plus a full ensemble preset that presents the whole string orchestra laid out across the keyboard range. The latter is useful for sketching ideas or laying down basic pads, and provides a quick and easy way to create tutti stabs, runs and more. 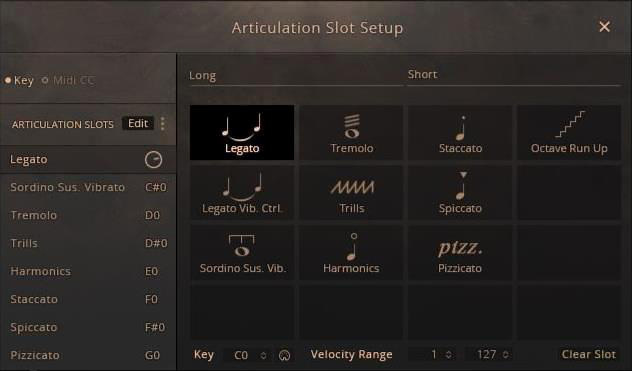 Each section preset contains everything needed to access articulations, control legato, portamento and repetitions, select section size and, perhaps most interestingly, a system for managing divisi parts, more on which later. The main performance page, with the full complement of 30 violin players loaded. 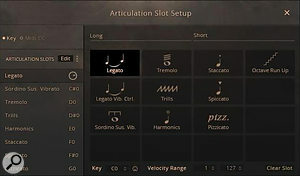 The legato articulation is selected, Auto Divisi and legato portamento/transitions are active.The default method of changing articulations is via keyswitches. However there’s also the option to use velocity switching or a MIDI controller instead. The latter method has the advantage of chasing MIDI, and is best for producing clean notation scores without those unwanted ‘rogue’ keyswitch notes. Articulation mapping is fully customisable, so you can load only the articulations you need, saving RAM and reducing subsequent loading times. The mixer provides control of on/off status, and volume and panning of the stereo pre-mix and close, mid and far microphones. Global effects are three-band parametric EQ, compression and convolution reverb. The reverb boasts 104 impulses, most of which were specially created for SE by Audiobro, including four ‘cinematic’ ambiences. A handy Transfer Settings feature allows easy copying of the Mixer settings across all sections — as long as they reside in the same Kontakt instance. All GUI knobs, sliders and switchable functions on the Performance and Mixer pages can be assigned to MIDI controllers, making it easy to adjust parameters such as attack time, portamento speed or EQ on the fly. The process of setting up of all these functions is identical to the Brass Collection library, the details of which are covered in the Brass Collection review in the March 2016 edition of SOS. The inclusion of divisi sections in SE is a luxury usually reserved for much larger libraries. It solves the issue of sample build-up typical in standard libraries where the number of players is multiplied by the number of notes played. Whereas other libraries require you to consider the need for divisi parts in advance and load separate divisi sections, SE sidesteps that forward planning with its Auto Divisi feature. 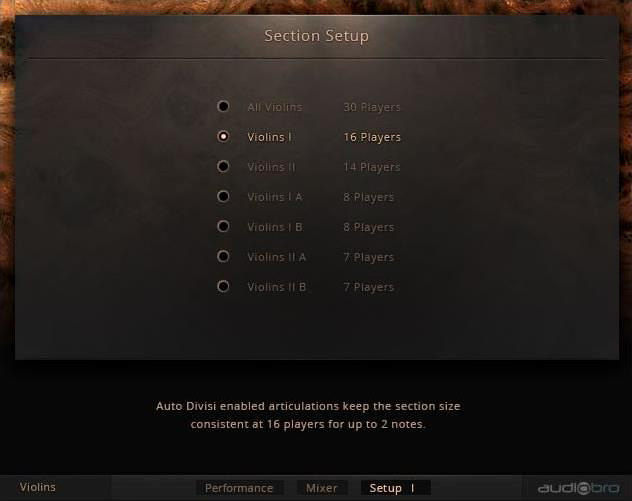 Auto Divisi monitors your playing and distributes divisi parts appropriately between the number of players in a section, thereby keeping the section size constant. This is best illustrated by the violins. The default setup on loading is the full complement of first and second violins, a total of 30 players arranged into four layers: Violins I A and B sections, with eight players each, and Violins II A and B sections, with seven players each. They will all play a single note in unison. When two notes are played, they are distributed between Violins I A and B (16 players) and Violins II A and B (14 players). Three notes divide as 16/7/7, four notes as 8/8/7/7. You can add more notes, but as the four divisi sections are all busy, SE will simply add more players. While it’s considerate of SE not to restrict the maximum polyphony, sticking to a maximum of four-part divisi for the violins, and two-part for the violas (6/6), cellos (5/5) and basses (4/4), keeps things within the bounds of realism. Furthermore, the legato and portamento transitions work polyphonically and are preserved between chords or movements within a chord, as long as adjacent notes fall within 40ms of each other. Outside that window they are treated as new, non-transitioned notes. Auto Divisi also works very cleverly with the sustain pedal. Hold down the pedal and keep it held down, play a note or chord, let go of the keys and move to the next chord — even change the number of notes — and Auto Divisi reassigns the voices automatically, at the same time guaranteeing all notes’ legato (or portamento) transitions are preserved. The articulation assignment edit page, showing all available articulations for the violins.The Setup tab provides the means to determine the section sizes. Sometimes you want the more intimate sound of fewer players. Alternatively, you might wish to control the behaviour and dynamics of first and second (or the divisi A and B) section players individually. The Section Setups box lists the options available to each section and, again, the violins offer the greatest number of options, having more players at their disposal. So to have individual control over Violins I and II, load the violins preset twice, set one up to play only Violins I and the other to play Violins II. You can even load just the A or B divisi sections if you want precise control over every line. This is also great for creating a particularly intimate, transparent-sounding string section with a lower player count. When using just the A or B divisi sections, playing polyphonically simply adds more players, so it’s best to treat these as strictly monophonic parts. Turning off Auto Divisi makes sure they stay that way. Up to 10 articulations are provided for each section (see the ‘Articulations’ box to find out which apply to each section). The presets load with articulations pre-assigned to the eight keyswitch positions, but these can be customised to suit your purpose. Legato sustains are the main feature, with crossfading dynamic layers controlled by the mod wheel. Each layer has progressively increasing amounts of vibrato, giving a wide range of expressivity from gentle, silvery calm to satisfying ‘El Cid’ intensity, especially in the violins. If you prefer to control the amount of vibrato yourself, the Legato Vib Ctrl articulation provides a vibrato amount knob to which any MIDI CC can be assigned. Both of these articulations feature a portamento speed knob. The choice of legato or portamento transitions is controlled by velocity, with a user-adjustable changeover point. Sordino Sus Vib brings the sweeter sound of muted strings. The absence of legato here requires careful playing or programming to avoid notes sounding disconnected, or ‘dropped’ players caused by excessive overlapping of notes when Auto Divisi is on. The same caveats apply to the Tremolo articulation, which sounds particularly good on cellos and basses, with laudably clear pitch definition on the latter. Trills (violins and violas only) come with four options: whole tone, half tone, major and minor. Major and minor trills conform to the key signature specified in the drop-down menu, making sure that the correct whole or half tone trill interval is played for any given note in that key. Unfortunately the choice of key signature can only be set via the GUI, so if you’re trilling in multiple keys, or need to be specific about melodic or harmonic minor scales, it’s better to assign the trill articulation to two different keyswitches — one set to whole, the other set to half, and switch between them as necessary. 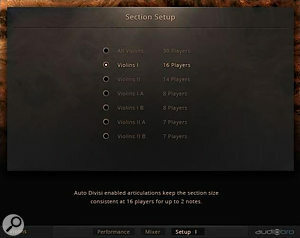 The violins’ setup page, where the section size is selected. Having both first and second sections as well as divisi sections for each of these, the violins have the most sizing options.The Harmonics are delightfully spooky, laden with breathy rosin. These have an additional release time control, extending the normal release time to enable long, dreamy crossfades. The short articulations (staccato, spiccato and pizzicato) all provide round-robin samples (4x, 4x and 2x respectively). The staccato and spiccato 4x round robins can optionally cycle continuously or randomly. For all three short articulations, a Slam amount knob applies extra compression and gain compensation for a fatter, more in-your-face sound. The Repetition feature (shorts only) is a convenient tool for executing parts that ‘chug’ along in strict tempo-sync’ed time, with three time-base options: 1/8th, 1/8th triplet, or 1/16th. There’s also a choice of three preset accent patterns or no accents — the latter allowing you to ‘ride’ your own accents on the mod wheel. The Repetition tool works effectively enough for the staccato and spiccato shorts, but is perhaps less successful on (or likely to be scored for) the pizzicatos. I do miss not having a marcato articulation for the violins, violas and cellos. However, a similar effect can be achieved by layering staccatos and legato sustains onto the same keyswitch. Staccato, spiccato and pizzicato shorts all feature round robins and a tempo-sync’ed Repetition tool.Tempo-sync’ed octave runs always prove useful, and these come in major and minor variations — selectable, thankfully, by MIDI. At the time of writing there is an issue with their tempo-sync’ed playback speed; they run just a tad too fast, finishing just before the target beat. NI are currently looking into the matter, and will hopefully have corrected it by the time you read this review. The Bass section has two additional articulations not shared by the other sections — marcato and the aggressively snappy Bartok pizzicato. That’s a shame, as they would be welcome additions across the board. There’s no denying the sumptuousness of sound produced by SE. It has a full, strident quality well suited to dramatic orchestral writing, yet it can equally be delicate and emotive. The Auto Divisi is especially well thought out and extremely welcome, as is the inclusion of both legato and portamento transitions. The ability to reduce the number of players is also a bonus, extending the applications of SE beyond the full-blown Hollywood approach. While SE may not provide every articulation you could wish for, all the important and most useful ones are there — certainly enough to create a passable representation of a string score. No library is perfect. The legato transitions of the violins when playing ff could be smoother, and there are occasional notes that are duller or quieter than their neighbours (notably in the basses), but in that regard I’ve yet to hear a string library that didn’t suffer similarly to some extent. Pricing may be an issue for some. SE is relatively expensive as a one-off purchase, although a crossgrade deal for owners of Komplete packages 2 to 10 offers a reduction of almost 50 percent. 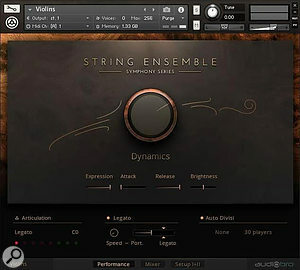 Audiobro’s experience and know-how have produced a classy string ensemble library, and at the crossgrade price, Native Instruments’ String Ensemble is definitely one for serious consideration. You needn’t spend a fortune on huge, multi-volume collections to get great results. There are some standout examples of relatively affordable string libraries with features and sound quality that belie their price tags. 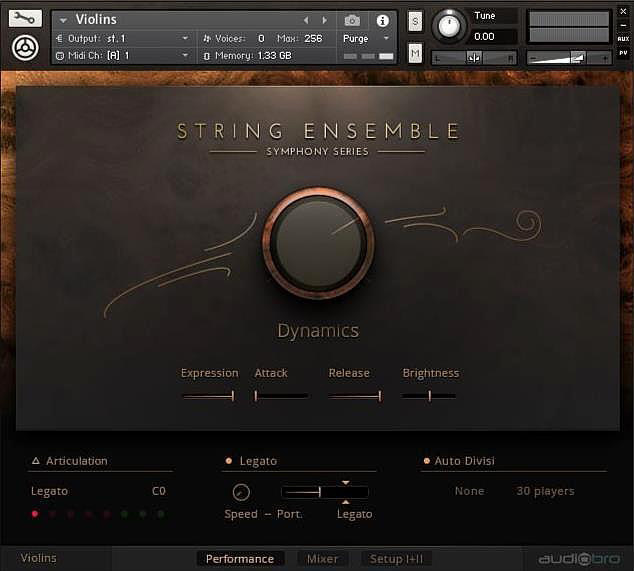 Cinematic Strings 2 delivers an exceptionally lush sound, with a fiendishly clever way of creating authentic-sounding fast runs, short articulations with adjustable lengths, and a clear, easy to use GUI. Cinesamples’ Cinestrings Core also features polyphonic legato transitions, and has an excellent sibling expansion library Cinestrings Runs. Audiobro’s own flagship library LA Scoring Strings also has an affordable version, LASS Lite. 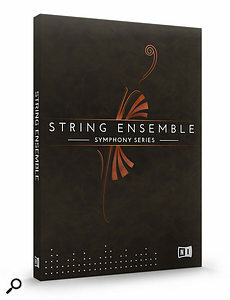 None of these examples, however, have divisi or scaleable section sizes, which currently remain unique to String Ensemble in this price range. Auto Divisi is very well implemented. Relatively expensive unless you’re able to take advantage of the Komplete crossgrade pricing. Violins, violas and cellos lack marcato and Bartok pizzicato articulations. Playback speed issue with tempo-sync’ed octave runs. String Ensemble sounds great right out of the box. Its major selling points are without doubt the inclusion of a well-implemented divisi system and the option of fewer players, both usually reserved for more costly libraries. The range of articulations, whilst not comprehensive, is more than adequate to produce dynamic, emotive orchestrations. And not unimportantly, it’s very straightforward to use. £429. Crossgrade from Komplete 2 to 10 £249. Prices include VAT. $499. Crossgrade from Komplete 2 to 10 $299.